It seems the Dako Artisan Automated Stainer ID #: 7213 has been sold and is no longer available. Looking for similar items? Click Here to easily view our available inventory similar to your search. The Artisan Staining System is a new generation of staining automation, providing you with the flexibility of manual staining coupled with the precision and consistency of automation. 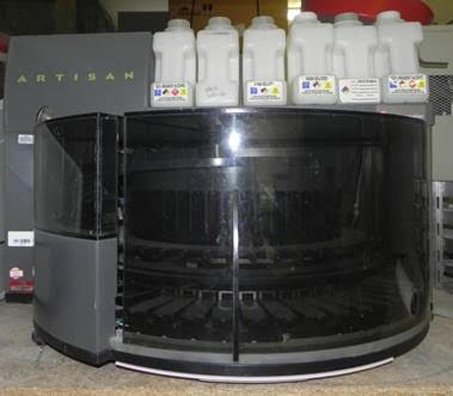 The Artisan has the ability to simultaneously perform both special stains and immunohistochemical (IHC) stains in the same run. The reagent carousel with up to 50 reagent packs and the slide carousel with up to 48 slides independently rotate to the position specified by the preprogrammed or customized staining protocols. Slide clips create a reaction chamber which allows the addition of any reagent to any of the 48 slide positions, providing users with the flexibility to load any special stain or IHC procedure in any slide position. Reagent Waste Capacity: Two 2L bottles, two 4L bottles. Additional 4L bottles are available from Dako to augment the capacity of the other waste destinations. Thank you for your interest in the Dako Artisan Automated Stainer (ID #: 7213). To speak with a representative, please fill out the contact form below or call us directly.